Chelsea and Manchester City have the first chance to win the first silverware of the season, when they both meet on Sunday at Wembley. These two giants of English football both reached the final against different quality opponents. Manchester City had the easier semi-final, as they they smashed Burton Albion 10-0 over two legs. Whereas Chelsea had a much harder semi-final, as they beat Tottenham on penalties after drawing (2-2 on aggregate) over two legs. Manchester City are heavy favorites to win the Carabao Cup final, which would suit Chelsea as they perform better as the underdogs usually in these finals. Chelsea will be looking for revenge after their 6-0 hammering at the Etihad recently. Both teams come into this final, after wins in European competitions this week. Manchester City overcame Schalke by 3-2 in the first leg of their Champions League round of 16 tie in Germany. Whilst, Chelsea overcame Malmo by 3-0 in the second leg of their round of 16 tie in the Europa League, to progress to the Quarter finals- where they were drawn against Dynamo Kyiv today. Chelsea come into this match with alot of problems behind the scene, with the club handed a two transfer window ban for the illegal signings of underaged minords, and Sarri’s future at risk. So can the Blues win to ease some of the pressures behind the scenes? Sky Sports main Event and Sky Sports Premier League have live coverage, following the conclusion of the big league game at Old Trafford. Kick off is at 4:30pm. Kepa is doubtful after suffering a minor hamstring injury, which led him to missing the Malmo game this week. Both Pedro and Zappacosta are doubtful after being ill this week, as both have been suffering with fevers. Other than that, Sarri has most players to select from. Gabriel Jesus is a doubt for this game, after missing the Schalke game midweek as he wasn’t even in the squad, due to a hamstring injury. John Stones is also a major doubt with a groin injury. Other than that, Mendy and Bravo are still nursing their long term injuries. Rüdiger, Alonso; Jorginho, Kanté, Barkley; Willian, Hazard, Higuain. Manchester City’s predicted starting eleven- Ederson; Walker, Laporte, Kompany, Zinchenko; Gündoğan, Fernandinho, De Bruyne; B.Sliva, Sterling, Agüero. These two sides have met 160 times over the years in all competitions, with Chelsea having a better head to head record compared to the Citizens. Chelsea have beaten Manchester City on 65 occasions. There have been 39 draws between these two sides in all competitions. Whereas City have beaten Chelsea on 56 occasions in all competitions. In terms of Carabao Cup/League Cup head to head record between these two sides, these sides have only met 2 times over the years, with each teams winning on one occasion each against the other. 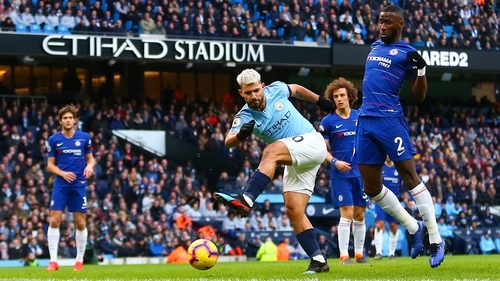 The most recent meeting between these two sides came recently, with Manchester City beating Chelsea 6-0 at the Etihad. But we have to remember that earlier this season- Chelsea beat City by 2-0 at Stamford Bridge. In terms of most recent meeting in the Carabao Cup/League Cup, it came all the way back in the 1984/85 season, where Chelsea hammered Manchester City by 4-1. Boy I would love that to happen again on the weekend! Manchester City are heavy favourites to win this final, and Bet 365 have priced a City win at 4/7. A draw between these two sides is being priced at 18/5. And a shock Chelsea win is being priced at 19//4. My realistic prediction for this game as a journalist is a 4-1 win to Manchester City, and if that happens then Sarri will most likely be sacked.